The toggle switch nut on Gibson Les Paul guitars can be a frustrating part to remove or install, despite the fact that it is super easy to get to. You see, since it is on the front of the guitar and so easy to see, Gibson wanted it to have a nice appearance. So they used a knurled ring to hold the switch in place, and there are no flats on which to fit a conventional wrench. This means that most folks end up using a pair of pliers to get it loose, which can easily lead to a scratch in the finish or a chewed up nut. Plus, if you are really careful not to damage the nut when installing it, chances are good that it will not be tight enough and that it will loosen up over time. There are special tools available, but they are made of plastic and strip out quickly. Fortunately, there is an answer to this problem. The marketplace for luthiers, Stewart-MacDonald, offers exactly the tool for the job: the adjustable toggle switch wrench. 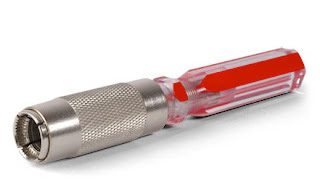 This thing is made of metal with a plastic screwdriver-type handle. You can rotate the barrel around the wrench part so it fits snugly on the nut, and it does exactly what the company says it will do. You might think it is a waste of money to buy such a specialized tool that may not be used very often, but $17.71 is cheap insurance when working on your treasured guitars. Check out Stewart-MacDonald’s website for ordering details!